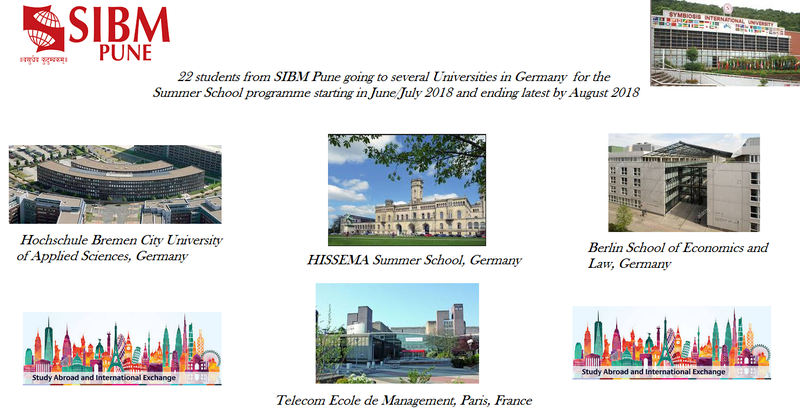 I am delighted to share with all of you that 22 students from SIBM Pune have been selected for summer schools in Germany starting from June/July 2018 and ending by mid-Aug.2018. Twelve students from the MBA 2017-19 have been selected for Hochschule Bremen City University of Applied Sciences, Germany . Three students from MBA (I&E) 2017-19 have been selected for Berlin School of Economics and Law, Germany. Four students from MBA 2017-19 have been selected for HISSEMA Summer School, Germany​ and three students MBA 2017-19 have been selected for Telecom Ecole de Management, Paris, France ​. ​These students will get an opportunity to learn a lot through this international exposure and will return back to SIBM Pune share their learning with peers. 22 students from SIBM Pune have been selected for summer schools in Germany and France 5 out of 5 based on 1 ratings. 1 user reviews.